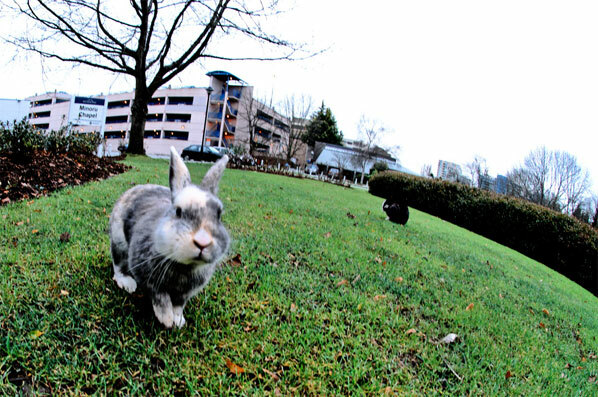 The walk through Minoru Park, on my way to rehearsal at the Gateway Theatre is hopping with bunnies. My co-director and I have named several of them, as their personalities emerge along with their upstanding ears, from the hedgerows. There is Piggy, Nosy, Brat, Cheeky, the Twins and Stanley. I have also taken (in self-preservation) to carrying bags of “not at their peak” vegetables with me, in anticipation of being met by some very curious, and rather assertive wiggly noses, beady, unblinking, expectant eyes and twitching whiskers. It is spring, and the animal life is abundant in the park. Rabbits, squirrels, the returning Canada Geese, ducks and chickadees make me feel rather like Snow White as I make my way to and from the theatre. Which means Easter cannot be far off. 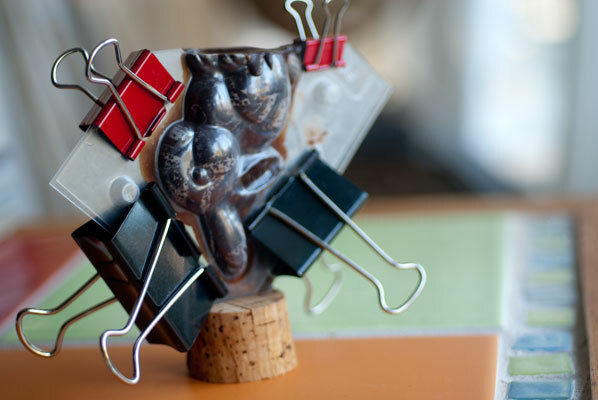 And that, of course, means molded chocolate bunnies. 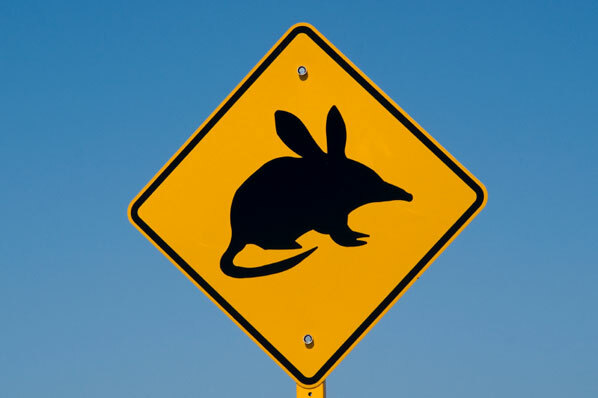 That is, unless you live in Australia, where rabbits are an introduced species and a pestilence. 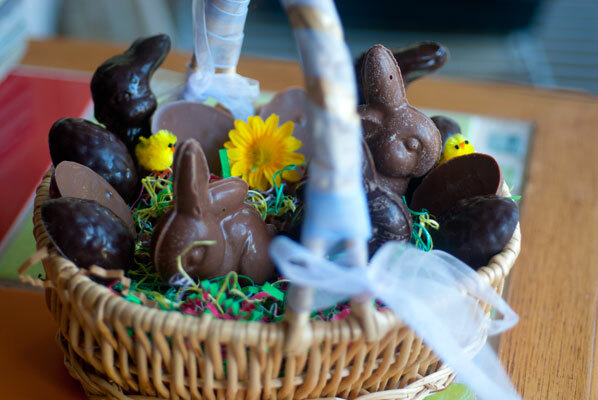 There, supported by several Australian confectionary companies, including Darrell Lea, famous for their addictive soft licorice, you can purchase a milk or dark chocolate bilby, instead. A bilby is an endangered native Australian marsupial, sort of like a long eared, long nosed rat. They are darned cute, and apparently owe a good deal of their fame to a story, written in 1993 by Australian children’s author Jeni Bright: Burra Nimu, the Easter Bilby. I would love to find out about other countrys’ favorite animals, molded in chocolate, but now I am getting a little off-track. I have wanted to try three dimensional solid chocolate molding, for ages, and this is the perfect opportunity. When I was little, I was always slightly disappointed when I bit into what I thought was a solid chocolate bunny, and it turned out to be hollow. I have grown up a lot since then, and have developed an appreciation for the skill of hollow molding. I had a go at it, with mixed results, way back in December of 2010. But today, I want a solid product. I have procured three plastic double-sided bunny molds, which look quite a lot like my favorite ones from childhood. The bunny faces sideways, has a chubby bulk (as a well-fed bunny should), and two distinct ears. It has, as my dear Mum would have said “a nice face”. I can’t stand overly humanized, or somewhat crazed looking bunnies (Bugs Bunny being the sole exception). The molds themselves are not the wonderfully sturdy poly-carbonate molds I have grown used to working with. These are quite thin and flexible, and will require a lot of support to keep them in the position I need, in order for them to set. 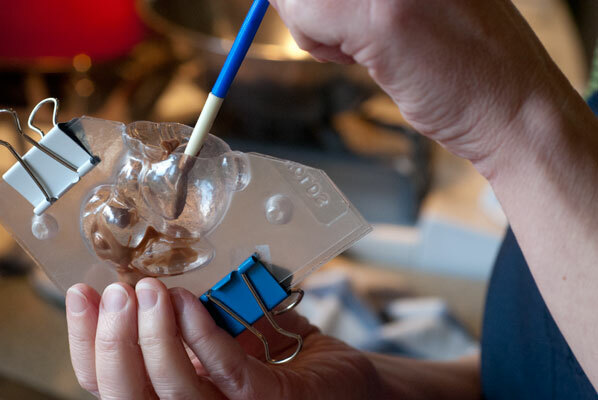 The first step is to line up the two halves of the mold, and press them together. 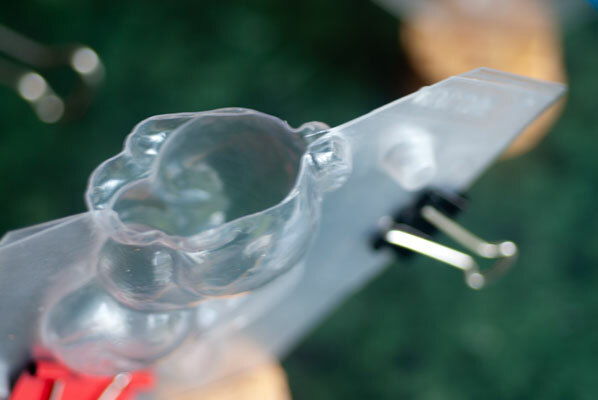 I then cut the plastic, across the bottom, with a razor blade, leaving the base open. This means the mold will need to hang upside down to set, once filled. In order to keep the two halves together, I enlist the help of my office supplies, and employ every large binder clamp I have. Next, I must figure out how to keep them upright, without toppling over, as they are now top-heavy. A quick trip to the art cupboard reveals several possibilities. I spot the tub of plasticine, one of my absolute favorite substances – what can beat squishing plasticine through your fingers, as a stress buster? I also spot the bag of wine corks, which have been accumulating for years, as I have always known they would come in handy for something. It turns out, they both make ideal bases for supporting molds, and are also a good way of balancing the load on the mold, if necessary. The set-up now looks much less like a kitchen, and the clamped together, cork and plasticine molds look much more like a wood work project, but I feel ready to roll. I go back and watch and re-watch the videos in the Ecole Chocolat curriculum, going through a dry run of the technique, with the tools, clamped molds and my hands, before tempering the chocolate. I paint the inside of the eye sockets with a small paintbrush dipped in chocolate, and push it right down to the back of the tail, to ensure I am not missing any spots, before I pour the bulk of the chocolate in. 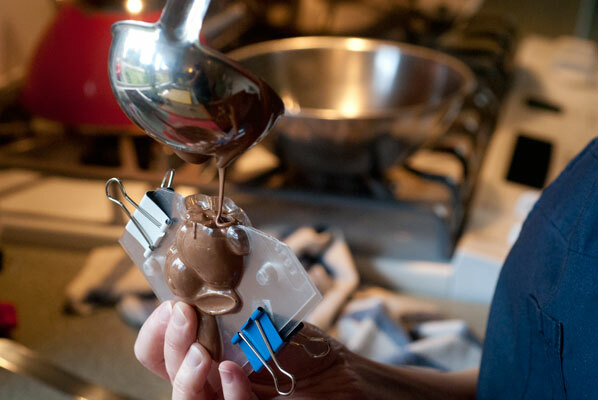 In some respects, it is easier to maneuver a small three-dimensional mold around in my hands, than the big poly-carbonate mold, although the chocolate does cascade down the sides. I scrape the bottoms and tap the molds on the counter top to break up air bubbles, and place them on the Silpat mat to set. And as the chocolate is setting, I realize the first of my errors! I can tell from the side view that I did not manage to bang out all of the air bubbles, as there are pockets in some of the crevices of the ears and eyes. I guess the bubbles had not worked their way to the top of the mold, even with my agitation, before the cooling chocolate trapped them in place. One of those “of course” moments, and a good reminder to try to keep air pockets from forming in the chocolate while stirring it, to temper. This is only the first in a series of “teaching” moments. As the chocolate bunnies cool, I can see that they are developing bloom. I realize later, when I go back and re-read the notes, that I should have moved the molds to a colder room, after 5 minutes, to pull the heat out of the cocoa butter. I think I was a bit afraid to touch them. I really should have remembered this step, from the morning I spent molding chocolate Valentine’s Day hearts at Cocoa Nymph, but I think I was more concerned about the seepage that seemed to be happening, in the areas where the mold was not clamped tightly shut. In hindsight, this is a very small problem, as the excess can be trimmed, and bigger clamps applied. It is not ideal, but it “small potatoes” compared to blooming chocolate. 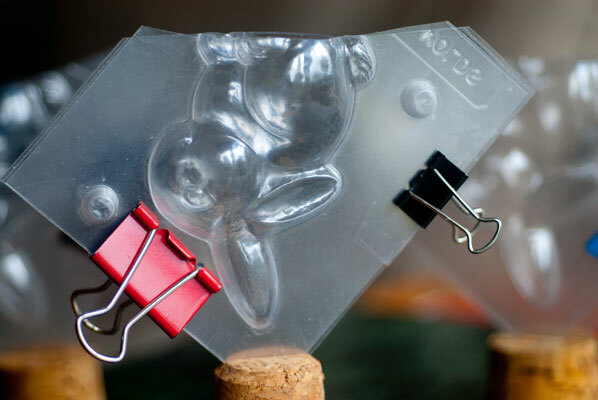 The molds release easily, and the bunnies are certainly solid. They sit up on the mat, nose to tail. 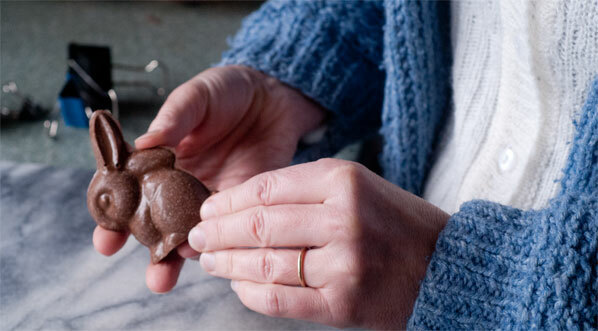 I have used up the residual chocolate in egg and “flat bunny” molds. It is a relief to see that these, at least, appear to be in temper, glossy and well defined. We all have a good laugh, looking at these bunnies. Since rabbits have any number of colour and marking variations, these guys fit in well with their living counterparts in Minoru Park. I have dubbed them, appropriately: Spotty, Streaky, Bubble Ear, Grey Eyes, Measles and Chip.